You’ve Heard of Flying Squirrels, But Have You Heard of Flying Squid? A neon flying squid gliding above the waters of Japan. Many are skeptical of the idea of flying, especially when they are told that animals other than birds or insects are capable of achieving flight. For this reason, the concept of flying squids sounds a little ridiculous. However, squid are accustomed to gliding in water, which means that they are able to use the same techniques to forcibly propel themselves in the air. Squid do not have to go through any drastic changes in order to glide. In fact, all they have to do is adapt different parts of their body to the air in order to maintain flight. The two fins serve a dual purpose of wings which will allow the squid to generate enough lift to glide over a distance of 10 meters. Scientists hypothesize that squid manipulate the movement of their tentacles underwater in such a way that the position of their tentacles sharply ends their flight, otherwise functioning as brakes. change the position of this tube, which will allow squid to propel itself in any direction. 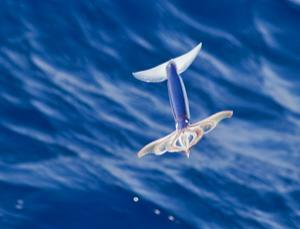 Many have made the comparison of gliding squid to rocket flight because of the way the squid propel themselves over water. There are certain types of squid that are considered to be a “flying squid,” which include: the arrow squid, neon flying squid, Japanese flying squid etc. The arrow squid have been witnessed to reach a height of 3 meters above water and to glide a distance of 8-10 meters (26-33 feet), whereas the Japanese flying squid is capable of flying over distances of up to 164 feet. 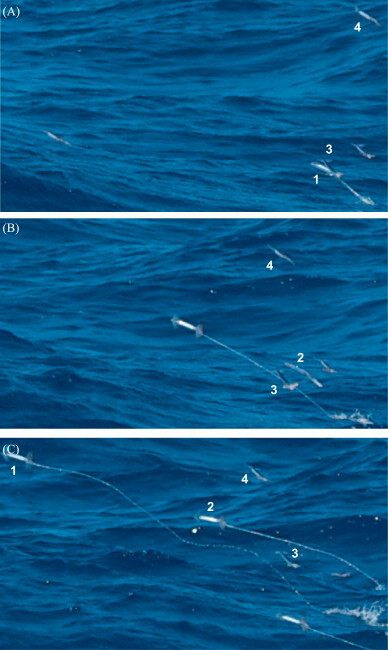 A series of shots taken in "burst" mode, which enables researchers to determine the velocity of the squid. A photographer, Bob Hulse, took the series of photos shown above, which had the same time intervals between each shot. This enabled scientists to evaluate the efficiency of these gliding squid. Scientists found that squid accelerate about 5 times faster in the air than they do underwater, in their primary element. As a result, flying actually helps the squid preserve energy as it travels across large distances and escape predators for whenever the squid sense a threat. Rocket Squid!, Oceanographer’s Choice, August 2012. Flying squids: the rocket science behind cephalopods, Los Angeles Times, February 2012. The final sentence of your post answers the key question, I think: WHY do these animals do it? Why go to the trouble of jumping out of the water and adapting to a new medium (air)? The answer is that they save energy in long-distance travel. That’s pretty cool. Are there any estimates of how much energy they might save on their typical migration trip? Because squid are capable of accelerating up to about five times faster in the air than in the water, it is expected that the cost of energy is one-fifth of what it would be underwater. I really like the comparison to a rocket; it gives the squid a far more unique form of generating thrust than a bird or flying fish. Do they have to change shape when reentering the water, though? When reading about the diving birds, it became apparent that if they did not mold themselves into a torpedo shape before hitting the water they would damage their wings. Is this the case for the squids fins?